With Net10 Wireless or TracFone your Motorola C139 Activate can either be done online at their respective web sites or by calling from a different phone. It is very simple either way. You will need the Serial number for the phone, the serial number for the SIM card, and the Zip code you want the phone number to be in. Where can I get the Serial numbers for my Motorola C139? The paperwork that came with your phone will often have a page with both serial numbers. The Serial numbers are also available in your "Prepaid Menu." Select "Menu" then "Prepaid." Scroll down and you will find "My IMEI" which is the serial number from your phone and then "SIM Serial Number" is right below that. You can use almost any zip code in the US to activate your phone. Your phone will then have the area code and local prefix. If your mother lives in St. Louis, MO you can use her zip code and then your phone will not be a long distance call for her. Go online to activate your phone. 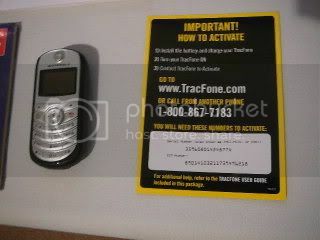 Go to NET10.com or Tracfone.com whichever is appropriate and go to "Activate your Phone." Then you will pick out the phone you are activating. Then you will put in the Serial number of the phone, the SIM Serial number, and then the zip code. You will then be asked to turn off your phone in 5 minutes and turn it back on. Usually your phone will be working when you turn it back on. If it isn't working in and hour turn it off and on again. It is really simple. Net10 offers minutes as low a 7.5 cents each. To get this deal go to the Net10 web site and sign up for "NET10 EASY MINUTES." If you sign up for the $75 per month plan you will get 1000 minutes. You can cancel the Easy Minute plan as soon as you get your minutes with no penalty. I normally use about 300 minutes a month. I had stacked up ten months of activation time on my phone. I added the 1000 minutes for $75 and then quit the Easy Minute plan. You only get 30 days of activity time with the Easy minute purchase. Motorola C139 Activate link to the NET10 Web Site Specials. Buy a Moto C139 at TracFone Now. Check out our latest Sale!